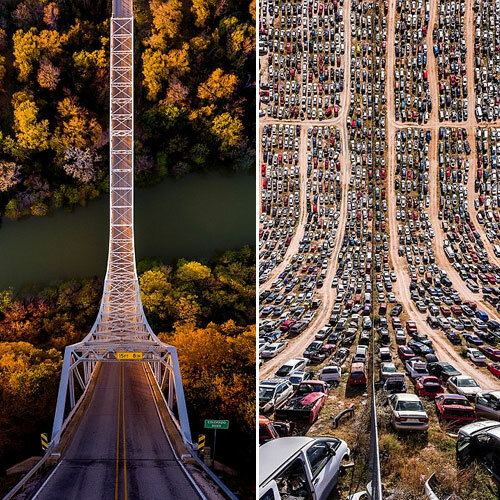 If you suffer from car sickness then these mind-bending photos of roads and tracks might not be for you. Turkish artist Aydin Buyuktas travelled around 10,000 miles across America taking photographs of unique thoroughfares before editing the images to give them a stomach-churning effect. One particularity dizzying image captures a bridge over a river in Texas. It gives the feeling of being at the top of a rollercoaster before a high-speed plummet down. Another shows a desert road in Arizona, with the red-hot tarmac cracked from the sun. Buyuktas took the quirky shots from the air using a drone. He told MailOnline Travel that he spent two months planning for his epic photography trip, using Google Earth to scout for spots.